Many people once believed that the stone gargoyles high atop old churches were the trapped souls of people who hadn't lived a virtuous life. I'd look pretty furious, too, if I'd been trapped in stone. The purpose of this interpretation of gargoyles was to convince people to attend church so that their souls wouldn't end up like the unfortunate tormented figures. 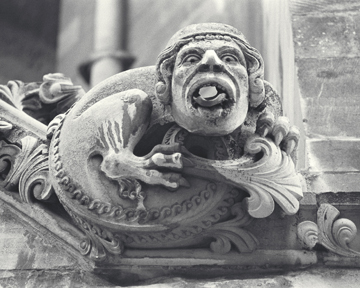 Here are a few gargoyles I photographed that look furious and frightening enough that you can understand why people might have believed these creatures to be damned souls. Gargoyle at Westminster Abbey in London whose eyes seem to follow you wherever you go. Gargoyles at Notre Dame Cathedral in Paris. 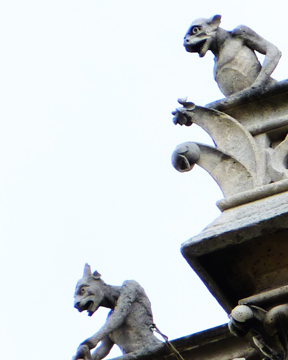 These fellows sit on a lower level than the most famous gargoyles of Notre Dame, and have a more unnerving appearance. it always amuses me that someone as lovely as you is so fond of creatures known for their ugliness. That top one is really something - looks like it has an evil crab attacking it! i adore gargoyles (as I'm sure you know!) As far as I'm concerned, they're one of the best parts of old buildings. And when I was at Princeton, I used to ferret out all the funny little guys hanging off roofs and gutters...most people there never even noticed them! I almost posted a third photo of a carving of the devil that came from an old building, but I thought that might be too creepy. Last night the husband was talking about how Tibetans had a type of gargoyle, in art more than buildings because, well, there's not much building material on the top of the world. He said exposing yourself to that stuff was to rid yourself of the fear of death (it was a natural segue from a conversation about human skulls on Ebay)...and while as a typical secular American I'm quite fond of being afraid of death, I can see the logic. Scaring people into believing in God seems so...primitive!